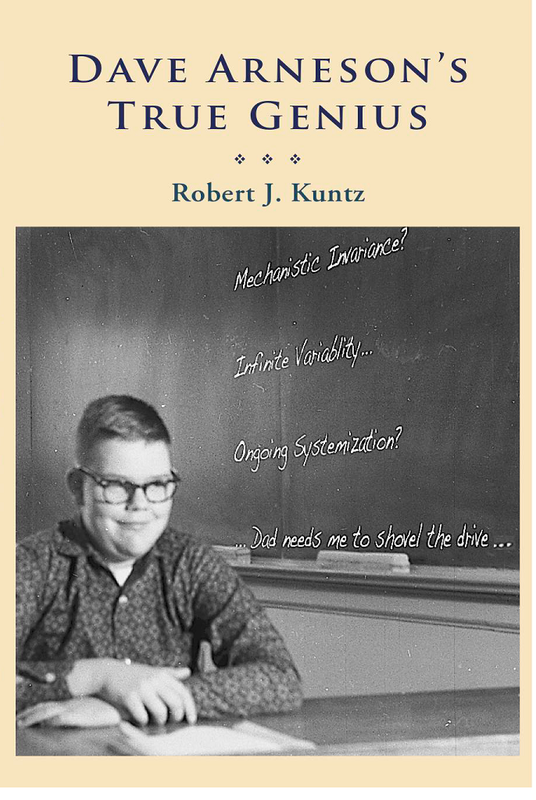 To reference my impressions from Robert J Kuntz's new book Dave Arneson's True Genius, I see old school as the original open system that Arneson created for his Blackmoor campaign that was brought to Lake Geneva with nearly two years of development and play testing already completed as a fully functioning game that was being run with a lot of players constantly. Gygax, of course, saw the implications and possibilities and immediately thought of publishing it. At this time the game existed in a pile of notes and in Arneson's head. So Gygax started writing based off of Arneson's notes, playing in Arneson's game and correspondence between the two. 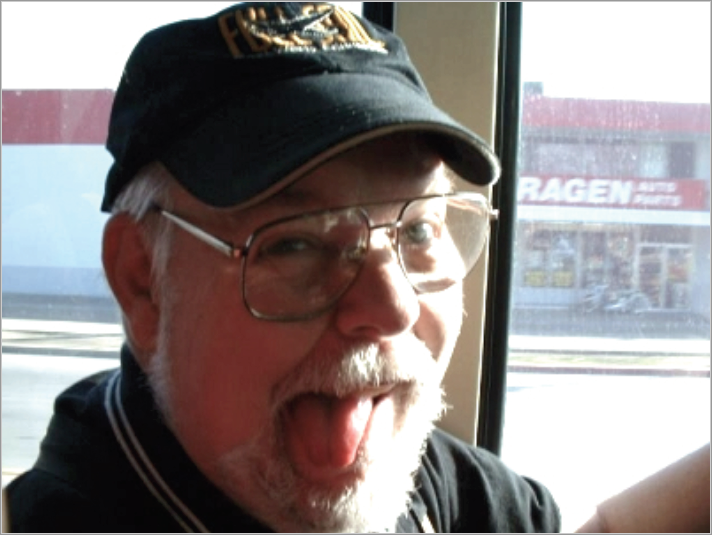 As Arneson's notes were not complete and since they did not live next door and did not have email to make communication fast and efficient and easy, Gygax started writing and play testing a version of the game in his new campaign Greyhawk. Rob Kuntz and the other players contributed to the writing of Dungeons & Dragons through their play and their ideas. The open-ended concept and the mechanical ideas were written down filtered through Gygax. So D&D was the Arneson creation with the Gygax interpretation dominating the written word mechanically, but with Arneson's open system intact. Even so, those who played in Blackmoor (and some also in Greyhawk) have testified over the years that D&D did not really change the way Arneson played the game. We also know that Gygax throughout his life and despite how he moved from publicly advocating the open mutable system of OD&D to the much more closed system of AD&D, he always played the open system in his own D&D and AD&D campaigns without the limits that he preached to others. There is one "OSR" writer and I doubt that he would come to any of your minds(that is not an insult), that preaches there is no old school or new school at all and that the is no significant difference between OD&D and 3E or any other game, as he has argued on a number of forums. That is why I said above that the "OSR" is vague. I also find it somewhat amusing that someone who claims there is no old school, nevertheless tries to write for that market and claims a seat at the table. Obviously his mileage varies considerably from mine. Now to be clear, I see Gamma World, Classic Traveller and a quite a number of other games as old school, there was a time when I did not, but I do now. I used to have a very short list of what were old school, now that list is much, much longer and I have gotten less and less and less rigid (an ongoing process) through talking with Rob Kuntz, while some other people in various places have gotten extremely rigid and they are all over the map from one end of the spectrum to the other. So my personal definition (YMMV) of old school is that the more open the systems are the more old school it is and the less open the systems are the less old school it is. So it could have been written yesterday and still be old school IMO. Also, to be clear, there is nothing wrong with using modules regardless of the reason that you use them. I, on the other hand, advocate self-designed sandbox play where the players are free to make any decision that they want to, without any limits. I consider wilderness adventures, dungeon adventures and anything else all to be sandboxes, whether you put in a lot of time creating it up front or whether you create it in real time on the fly. If I tell my players that they see 10 portals shimmering in the air in front of them, there are usually several options that do not involve going through one of the portals. On the other side of each portal I picture in my minds eye 10 different planets floating in space, each unique and different, and it is never a case of having the same encounter behind all of the doors. My players keep going through portals. I am supporting the BLUEHOLME™ Journeymanne Rules Kickstarter because I really like seeing the Holmes Rules expanded to Levels 1-20, and with a lot of new Dr Holmes material in it. I don't view it as a replacement for OD&D, but as a resource it is compatible and many of the kickstarter stretch goals items can be used directly IMC. I am not supporting it because it is "OSR" but because IMO it is meaningful and needed to be done and is IMO it ishistorically important to the memory of Dr. Holmes who volunteered his time and skills to making D&D more accessible to beginners who lacked the assumed background knowledge that OD&D assumes. It does not hurt that the author who goes by the screen name of Vile happens to be a great guy and a valued member of many forums, including my own. I do agree that most of the arguments, drama, and hurt feelings make about as much sense as level limit and alignment arguments do(to paraphrase a member of my forum) or IMO not so much. What Arneson believed his whole life and what Gygax championed back in the beginning is play in a way that is fun for you and your players and it will be completely different from what anyone else is doing, and that is the way it is supposed to be. I also believe that the "OSR" has both encouraged and stifled creativity at the same time. Because of that the Renaissance part has not been seen to the degree that I think it can and should be seen. I think that the day will come when they (whether many or few) will go back to the original open concept of Blackmoor, Greyhawk, Kalibruhn and OD&D and do something different with it and recapture the lightening in a bottle (product) and it will grow like a wildfire. These rules are as complete as possible within the limitations imposed by the space of three booklets. That is, they cover the major aspects of fantasy campaigns but still remain flexible. As with any other set of miniatures rules they are guidelines to follow in designing your own fantastic medieval campaign. They provide the framework around which you will build a game of simplicity or tremendous complexity -- your time and imagination are about, the only limiting factors, and the fact that you have purchased these rules tends to indicate that there is no lack of imagination -- the fascination of the game will tend to make participants find more and more time. We advise, however, that a campaign be begun slowly, following the steps outlined herein, so as to avoid becoming too bogged down with unfamiliar details at first. That way your campaign will build naturally, at the pace best suited to the referee and players, smoothing the way for all concerned. New details can be added and old "laws" altered so as to provide continually new and different situations. In addition, the players themselves will interact in such a way as to make the campaign variable and unique, and this is quite desirable. Key words and concepts, "guidelines" provide a "framework" for your game of "simplicity" or "tremendous complexity" with the only real limiting factor being time. Begin slowly, build naturally (organically), then add new details, and/or alter old laws to provide continually new and different situations. The decisions the players make will produce a campaign variable and unique. Does this describe your campaign? If not, why not? The answer to that question is not for you to share so we can judge you, it is for you to answer in your own heart. You should judge yourself and if you are happy with the judgement you make, cool; however, if you are not happy with the judgement you make, then change things in ways that make you happy. I can only speak for myself and say that that does describe all of the campaigns that I have run and am running and I hope it describes the campaigns that many, if not all, of you run. This has rambled all over the place, but I hope you all followed the gist of what I am saying. What is Dave Arneson’s True Genius?? Why is it that the question still persists of what a Role Playing Game is 46 years after David Arneson first contrived it into being and then a little later with his new partner, Gary Gygax, made the concept available commercially? 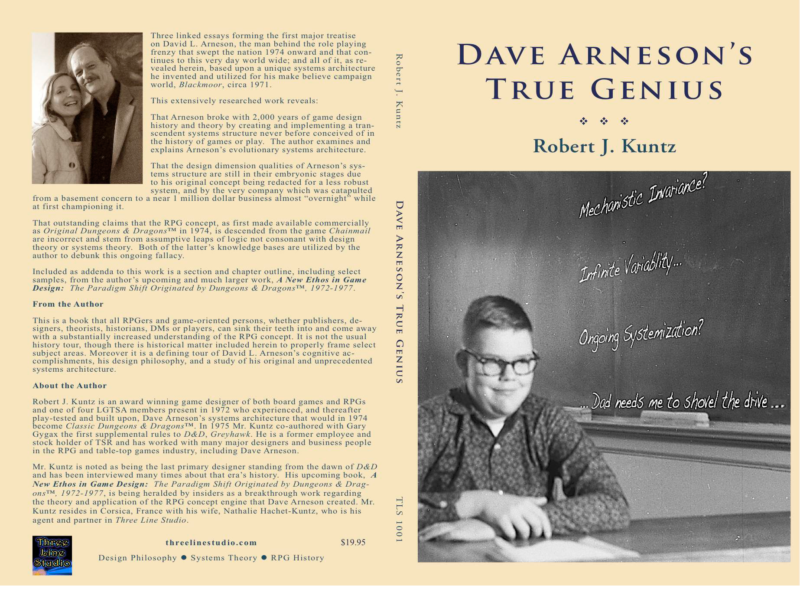 Award winning game designer and author Robert J. Kuntz presents the answers in the book, Dave Arnesonʼs True Genius, and they will surprise the entrenched, provisional views of those who have been in a perpetual argument until this point. 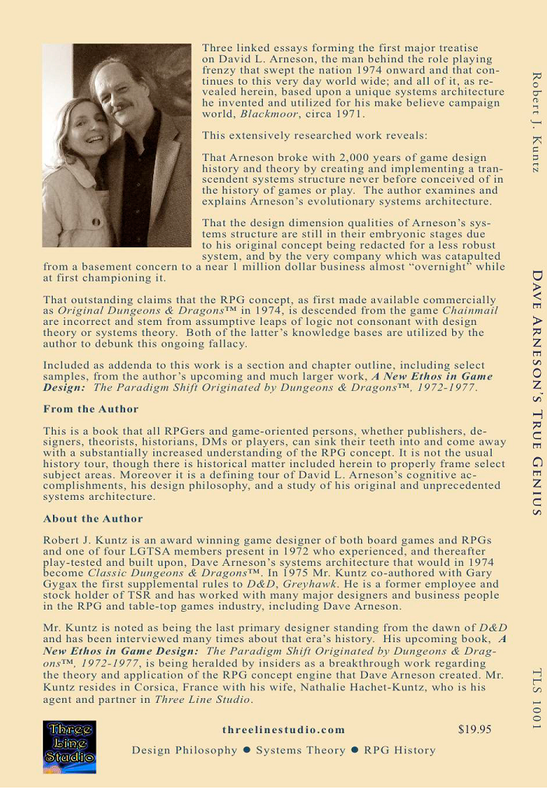 In this book Mr. Kuntz describes and explains through design theory and systems theory terms and examples what Arnesonʼs genius accomplished which is no less than the shattering of 2,000 years of game design history and theory. This will go live at 10:00AM GMT or 6:00AM EDT on the 13th of April. From the Kickstarter by Michael Thomas! Just follow the links to check it out!